I live in knightstown and i go by there almost every day. the true story is that in the 1920s it was a heart hospital. many people died in there and the backyard is a graveyard. i have friends that live there and when i spend the night we will walk in the door and there is blood on the floor. and yes like on the other posts there is a lady in a black dress that walks around in the house. NEVER GO THERE! The house that your telling stores about I live in you may not believe me but the only thing that is true about the house in the article is that it used to be a hospital. The history of the Pest House (7014 west county line road Knightstown, Indiana) is a long colorful history that I have researched from a very young age. Me and 6 others in my family in it we have had the Ghostbusters come twice yes they have found things but everyones house has ghosts. I have lived in the house my whole life and nothing spectacular has happened its like any other house just older. Rachel, you know when I first looked at purchasing a house in Ktown, I saw the house when we came down the road and I told my husband that if I had the money I would want to by THAT house, having no clue of the past of the house, but to be honest with you, I think it is a gorgeous home and now that I know the history of the home, it doesnt change what I first thought when i saw it, its a very lovely home and well maintaned. Love it. wait, we arent talking about the same house, your refering to this house right http://www.hcgs.net/PestHouse.jpg or this one your not refering to this one right http://facweb.furman.edu/~bensonlloyd/hst41/h41p04.jpg (the morgan house) Im refering to the morgan house, which I believe is on 109?!?! natalie, the first link you have is the Pest House, and yes the second one is actually on 40 (main st). they do kinda look alike but theres a few houses in knightstown that have that same kind of structure to it. thought the pest house is the only one i’ve ever heard stories about and i’ve lived in knightstown for almost 20 years. My houseparent from the indiana soliders and sailors childrens home told me about this house. She said it was really creepy. She knows i love going to places like this and i really cant wait to go. I agree with Rachel, who should be considered the expert on it since she lives there! I think there is more legend than haunting at the “Pest House”. But, I’m sure it has had its interesting moments – right, Rach? If you are looking for it on HWY 109, you are looking in the wrong place. That 109 house was built nearly identicle to the old hospital house (same builder I’m told, and from the same time frame). But, it isn’t the right one! The real house is tucked neatly back in the woods on a dark, winding road just outside of town. The location probably adds to its legendary ominous status. Stories of the old house have been passed along through several generations of kids around here. I’ve lived in KTown for a long time and have heard each generation add its own little twist to the story. The older stories say it was a plague hospital and the dead were buried on the grounds or in the woods nearby in unmarked graves. The family’s didn’t claim their dead for fear of the plague. But, as far as I know, the family living there hasn’t had any major complaints. The house is actually quite beautiful. The house in the picture from Natalie, called the Morgan House, is on US 40 (Main Street), just west of the BP gas station and just east of a funeral home. The house on 109 just north of US 40 is often mistaken as the Pest House. KTown has many beautiful historic homes. It is a shame that so many of them become apartments. The pest house is NOT located on 109 it is on west county line road across blue river, I lived 4 houses down from it for years, Whoever says the house on 109 is the “Pest house” is wrong! Thank you Rachel for sharing your story about the true “Pest House” in Knightstown. I am not sure if it was your family or not that I talked to as part of my research for a documentary / movie back in the 1993-94 time frame. I was working with a Las Vegas film company at time while going to college for film. I lived in New Castle at the time, now live in Indianapolis. Unfortunately the budgeting for the film took to long to finalize and I went onto other projects. But I still think it would make a great documentary, if you are interested. At that time it was being remodeled also, and the man I met who owned the house and whom gave us a tour of the house, I think only lived with his wife in the house at the time. They were trying to restore the house to the original period style, with some modern amenities added in to make it functional. I do volunteer with a paranormal group, while I do my paying day job. But I am sure you have had enough people investigating your house over the years and I do not want to interfere in yours or your family’s life or have you end up with unwanted people in your front yard. But if you would like to talk some time about your experiences, we do not charge for our investigations, you can contact us at 317-883-9104. I would like to keep in touch and talk more about the house thank you. 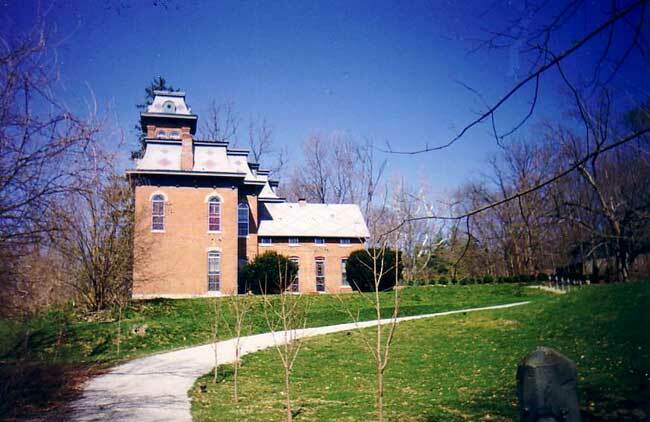 This house’s repuatation as haunted originated after being used as a Civil War hospital. Between that time and the smallpox outbreak of 1902 it was used as a clinic to quarantine people with mental and infectious diseases. Many people from the 1860s to 1920s died and were buried on the property. I have been in the and around the house and heard scores of stories about it. Henry County has a well documented history of the property easily available. my cousin used to live there and the stories are true!!! !on halloween night and the lady in the black dress was out i heard screams and everything!!!! i used to live near there as a baby. my mother lived in that town along with my grand parents and great grandparents. My mom said every day she would have to drive past it to go to school and she would close her eyes because it was so scary. since it is up on a hill, she could see it out her window at night. She also told me that they buried the people in the hills on/ around the house. My roommate’s family currently lives in this house. We’re in college, so she lives here at school most of the time, but when she goes home, that’s her house. hey i am seriously trying to find something that beats our best investigation. Vernon indiana. But i havent seen anything that meets that yet. if you have any information on some really good places please email me 🙂 thanks MTPI! This story is eerie because it was actually written by the ghosts of this haunted house, known as ghostwriters. Possibly related to the Ghostrider too.